Well over 200 people – parents, students from K-8th grade and friends – attended our 2nd Annual Schechter Science Showcase, as families experienced, learned and explored science throughout the afternoon. Each family rotated through specific sessions facilitated by teachers, parents and alumni, built on various topics within the disciplines of science, math, engineering and technology. 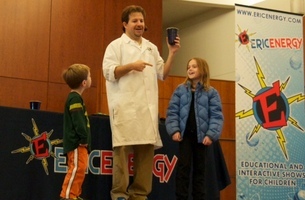 In addition, all participants were entertained by “Eric Energy,” who presented fun and interactive experiments related to “green” energy.